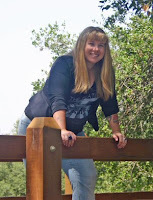 Full Moon Bites: Interview & Giveaway with Kristen Beairst, author of Love Like Krazy! Interview & Giveaway with Kristen Beairst, author of Love Like Krazy! Holly: Hi Kristen! Would you tell us a little bit about yourself? Kristen Beairst: Well, I’m a So Cal girl who’s been addicted to romance novels since I was a teenager. I have two energetic little girls and a very tolerant husband. Between the kids, the hubby, a day job, writing, and reading, I also enjoy sports. I’m a huge New York sports fans and I love to participate in half marathons. Kristen Beairst: I dreamt the scene where the hero mistakes the heroine for a stripper and she thinks it’s hilarious. When I woke up, I started wondering about who these two people were and before I knew it, I knew their story. Kristen Beairst: Yes! My next release is in early September and, if everything goes as planned, another in December. Kristen Beairst: This is the first novel published. My first novel length story I wrote when I was 11 and it should NEVER see the light of day. EVER. Kristen Beairst: Picking out just the right words as the story unfolds. I’m a firm believer there’s a perfect word to fit each situation or description. Kristen Beairst: I LOVE to hear what you think! Good, bad, ugly – I like to hear it all. It helps me improve and helps me understand what you want in a story. So please, leave reviews, drop me an email, post a note on Facebook – I seriously want to know. And most of all, THANK YOU for your time! Kristen Beairst: I hated editing, but I’ve learned to appreciate that editing is the point in the writing process where you’re really making your story shine and turn it into the best it can possibly be.